Inverted T-cross section designed for optimum strength to weight ratio; 4-section telescoping type, extended and retracted proportionally by a double-acting hydraulic cylinder and a cable-crowd system. Fitted with easily replaceable self-lubricating wear pads for smooth operation. Quick Reeve Boom Point – Fitted with two upper and three lower high-density nylon load sheaves mounted on heavyduty roller bearings. Removable pin-type rope guards. Boom Elevation – Double-acting hydraulic cylinder. Working range from 5° below horizontal to 75° above. Load Hook – 5-ton (4,5 mton) capacity hook with heavyduty swivel and weight is provided for single-line operation. Jib (Option) – Inverted T-cross section designed for optimum strength to weight ratio. 2-Section Jib 30’6 (9,3 m) to 55’ (16,8 m), Offsetting (0°, 15°, 30°); manually extended. Features Jib Jack and stow bracket design for one-man operations. Compatible with models 40100s and 40124S. roller virtually eliminates load line stacking while spooling. High efficiency two speed hydraulic motor equipped with patented brake valve for precise lowering. 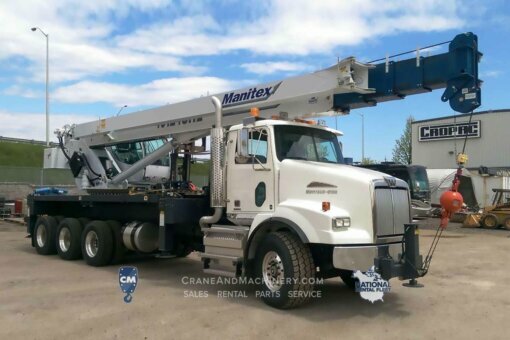 Main Hoist – Maximum theoretical line speed 453 fpm (138 mpm); maximum theoretical bottom-layer line pull 13,050 lbs (5,919 kg). Wire Rope – 380 ft. (115,8 m) diameter. Low Torque type; a designed balance between rope lay and strand lay offers characteristics similar to those attributed to rotation resistant ropes at a 3.5:1 safety design factor. 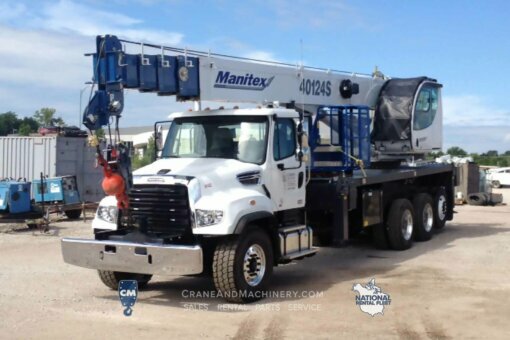 Continuous rotation, free swing system assists in tandem lifting and centering of boom over loads. Externally mounted, double-reduction planetary gearbox driven by hydraulic motor. Equipped with a dual brake system; spring-applied hydraulically-released Parking Brake and a foot actuated Dynamic Service brake. Ball-bearing swing circle with external gear. Out-and-down style outriggers, operated independently for precise leveling. Fully extended, intermediate extension and fully retracted outrigger beam positions. 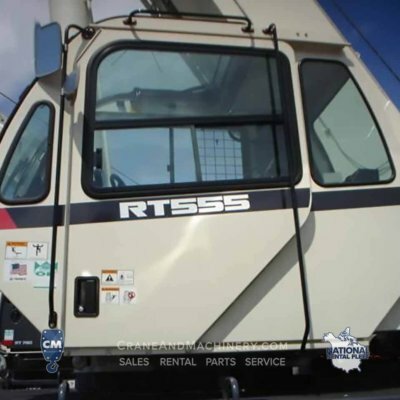 Bubble levels located in operator cab and near outrigger manual controls. Maximum outrigger spread 22’ (6,7 m), Intermediate outrigger spread 14.3 ft (4,4), 16” (406,4 mm) diameter floats. Front Bumper Stabilizer – Single stabilizer assembly mounted at the front of the truck (required); maximum float load is controlled by preset counterbalance valve to prevent overloading the stabilizer. This feature requires truck front frame extensions, consult factory. Lower frame is mounted to chassis by threaded rods and clamp plates. 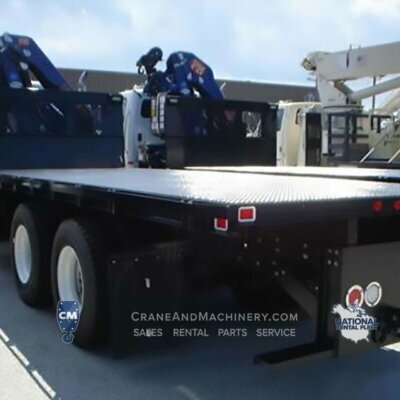 No welding, drilling, or bolting to truck frame is required. Lower Frame – Torsionally resistant, rigid 4-plate design with integrated outriggers and pedestal. 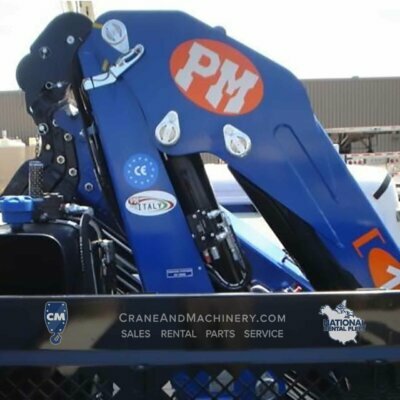 Rear Underride Protection – Standard on factory-mounted cranes. Fabricated structure mounted under rear of crane. Complies with Bureau Motor Carrier Safety Standard 393.86. Boom Rest – Heavy-duty fabrication. Easily removed to simplify loading and unloading truck deck. Single cab enclosed operator platform and seat mounted to turret. 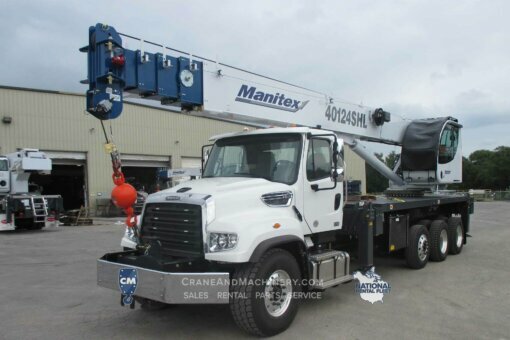 Four “pilot operated” single-axis crane controls provide precise metering and multifunction capability; winch control fitted with hoist drum rotation indicator (HDRI). Controls are arranged in accordance with ANSI B30.5 standards. 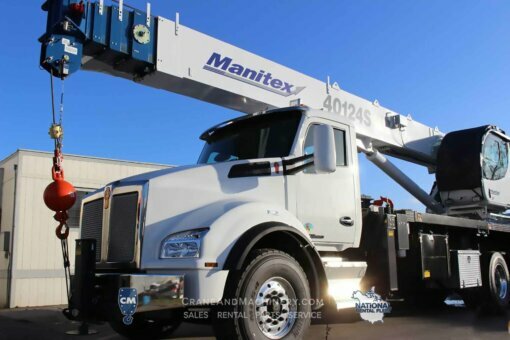 The operator station also includes engine start/stop, electronic foot throttle, signal horn, load moment indicator display, view of boom angle indictor, load chart, range diagram and the Manitex ACCUSwing control that allows the operator to adjust swing speed up to a maximum of 2.0 rpm. The operator can with a switch change from no-free swing to free swing. Stand features include curved glass, 0° to 20°⁰ cab tilt, Automotive door, heated cloth seat, 8 seat adjustments, lumbar support and adjustable head rest, sliding windows, rear pop out window, top hinged hatch, standard diesel fired heater, retractable sun screen, windshield cover, upper hatch guard, 12 volt DC outlet, E-Coated cab (10 year rust warranty). 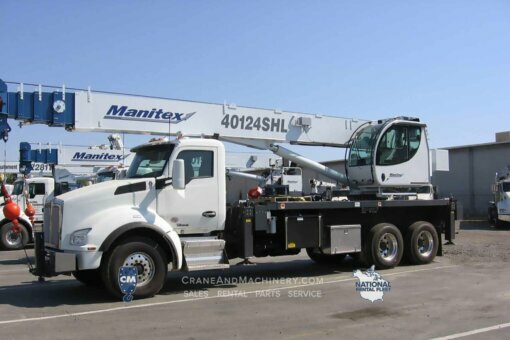 Hydraulic System – A 3-section pump direct-mounted to power take-off on truck transmission provides 41.7 gpm (158 lpm) to the hoist, 28 gpm (106 lpm) to the boom hoist and telescope circuit, and 12 gpm (45 lpm) to the swing and outrigger circuit. 115-gallon (435-liter) baffled reservoir includes suction ball valve with strainer and two 25-micron filters in the return line. Use of SAE O-ring and face seal O-ring hydraulic fittings throughout system. Hydraulic Cylinders – All load-holding cylinders are equipped with integral holding valves. Load Moment Indicator – CAN bus interface system maximize expansion capabilities. Senses boom hoist cylinder pressure, boom length and boom angle. Audio-visual warning indicates overload conditions and overload shutoff feature prevents continuing overload. 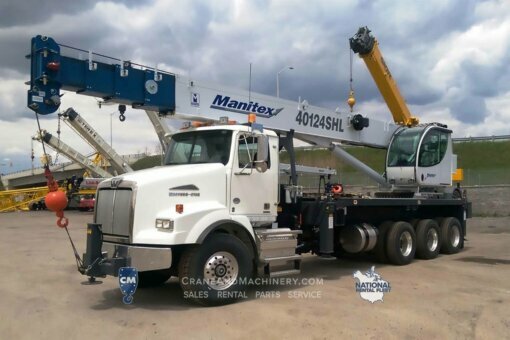 Operator can access all relative crane configuration and load conditions via a graphical display at the operator station. 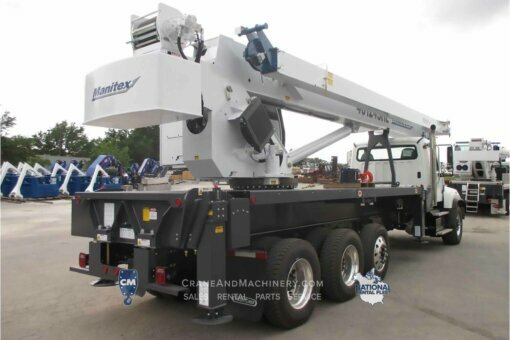 For added reliability, the LMI system features an external boom length sensing cable. There is an event recorder and WADS-Work Area Definition System. 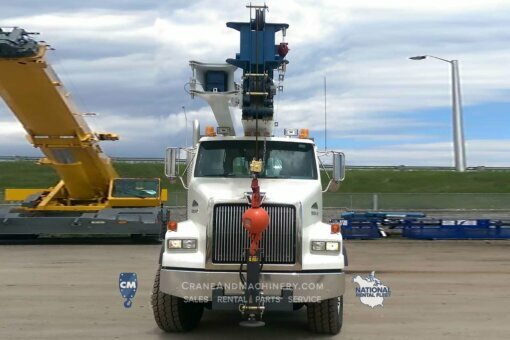 Wired Anti-Two Block System – Audible warning and shutoff functions prevent hook form contacting boom point. Switch is potted to ensure reliability. Back-up Alarm – supplied on factory-mounted cranes, electronic audible motion alarm activated when truck transmission is in reverse gear. Electrical – State-of-the-art, weather-resistant components throughout; automotive style electrical system for easy installation. System is designed to withstand high pressure washing and varying climates. Design/Welding – Design conforms to ANSI B30.5. Welding conforms to AWS D1.1. Tested to SAE 1063 and SAE 765. 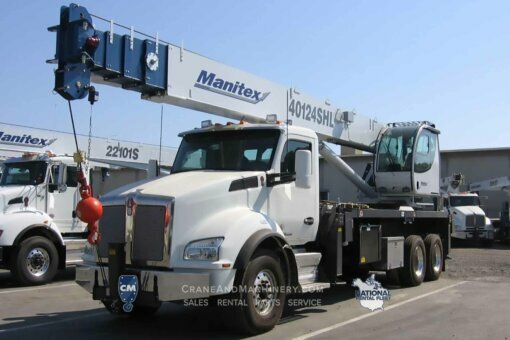 Manuals – Operator/maintenance and parts manuals depict correct crane operation, maintenance procedures and parts listing. Warranty – 12-month warranty covers parts and labor resulting from defects in material and workmanship. * In order to ensure continuous improvement, specifications may change without notice.